1. I am very, very, very sad that I didn't get to see Anthony Bourdain on The Colbert Report tonight because the resort has 5 ESPN channels, the Speed channel, and the Golf channel--but no Comedy Central. 2. 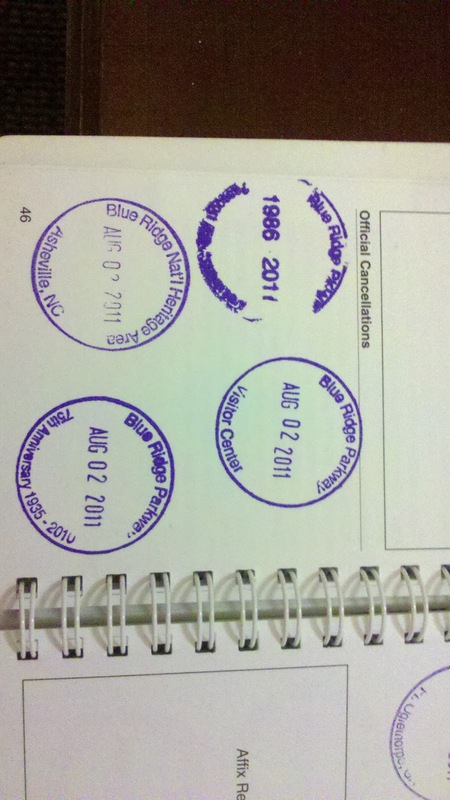 I collect National Park Passport Stamps. I may try to convince the hubz to stop by a few locations so I can pick up some more on our way from GA to VA. I've already made a list of possible locations. Blogger keeps rotating this photo. I give up. 3. 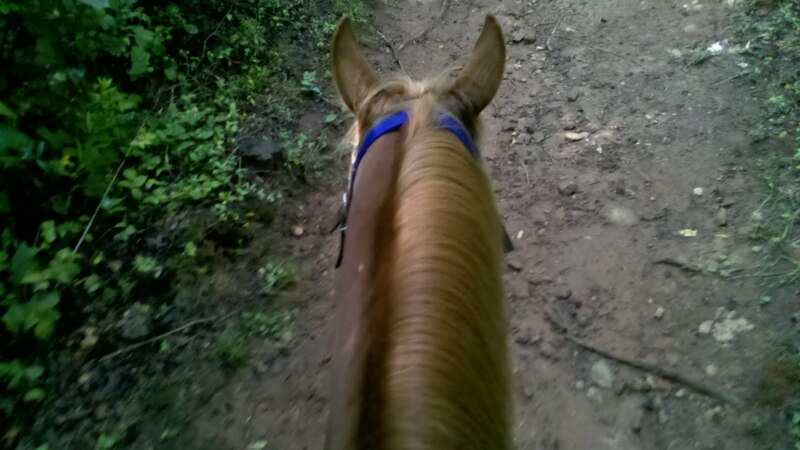 I rode a horse for the first time ever on this vacation. I was a little bit terrified once we got moving. Then we saw a black bear cub right at the beginning of the ride. Also very cool yet terrifying. All I could think was, "Where's the mama?" 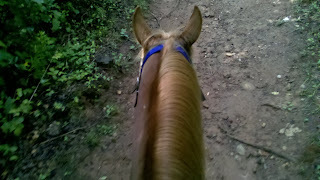 My view as I was riding Hooch. Yes, he was named based on the movie "Turner & Hooch." 4. I am insanely competitive and hate losing. I think this is [yet another reason] why yoga is good for for me--because there are no winners or losers and if you can't do something then there's no judgment involved. 6. I can't wait to get back to a normal schedule so that I can cook again. (And then I'll have topics to write about other than yoga and vacation!) Unfortunately, even once I get back home I'll only be on a regular schedule for a week before my life gets all screwy again. 7. I hate it when I'm hanging out with a group of friends and the conversation turns to running. This is a problem because 90% of my friends are runners (or so it seems, at least.) Then again, they all probably feel the same way about me talking yoga so it all evens out, right? 9. I drive with my left foot on the dashboard 95% of the time. I am sure one of these days I'm going to lose my leg because I'm in a car crash and it's going to get damn near ripped off. 10. I have had the most ridiculous girl pop songs stuck in my head for the past few days, including "Feel the Rain on Your Skin," "Pocket Full of Sunshine," and "You Belong With Me." I have no problem with bubble gum pop, but these songs won't go away. It *almost* makes me want to listen to listen to this over and over again, just to get them out of my head. Whole Lotta Shakin' Going On! Summer Wrap #2: Good Eats in Venice! Summer Wrap #1: 22 is a lot of classes. Birthday Madness, July Wrap, and August Goals.